People from cultures where haggling is not a regular practice are sometimes uncomfortable in dealing with market and street vendors. They may even accept the offer of unknown locals to help them get a good price — in which case they will end up paying not only the vendor but also the helper. 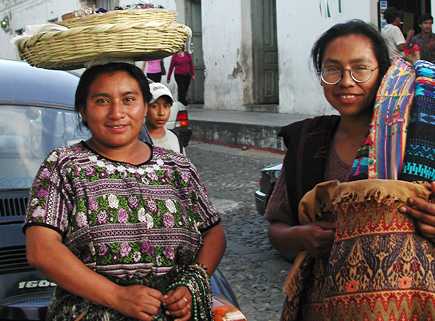 For residents of the Mesoamerican region, haggling is a natural and expected part of most transactions. Archaeologists have established that a lively trade network permeated ancient Mesoamerica, and trade is still a large part of everyday life in the region. More than just a method of marketplace price regulation, it is also a social activity. A purchase without conversation is an act of rudeness. Haggling is not something to stress over — in fact, it should be fun, at its best full of wit and good humor. Following are four keys to successful haggling. The key to bargaining is knowing what an item is worth before beginning the negotiation. There are two ways to look at value: one is market value — what is the going price in the context in which you are negotiating? The other is personal value — how much are you willing to pay? If the item is unfamiliar or unique, you may have trouble assigning a market value to it. In this case you must calculate its value to you and know what this value is before you begin bargaining. The best approach is knowing the market value. And the best way to learn that value is not to snap up the first example you see. Compare similar items. Fixed-price vendors such as government-run craft shops and hotel stores can establish an upper price guideline. Inquire with a few vendors (but don’t be impolite and take too much of their time if you aren’t serious about the possibility of making a deal). Listen in on other negotiations. Gradually you will develop a sense of the object’s market value — as a bonus, you may also develop a degree of connoisseurship that will help you to distinguish superior items from inferior ones. Once you know what something is worth you can share a good-natured laugh with the vendor at an outrageous initial offer. Haggling in el mundo Maya is productive pretty much in inverse proportion to the amoung of time spent on it. If you think you can rush in, quickly slam out a killer deal, and hie off with the goods, you are likely to be disappointed. It’s also a good idea to potter about a bit rather than heading straight for an item that interests you. An experienced buyer affects an attitude of indifference. She is not at all sure that this is the item she wants, and she needs to be persuaded. She is ready to move along at any moment. Hesitation is helpful, and silence, suggesting uncertainty, can be powerful and invites progressively lower offers from the vendor. Walking away is a time-honored technique. Usually the vendor will call you back with a lowered price. But realize that he may call your bluff, so be prepared to keep on walking, or to swallow your pride and go back and pay on the vendor’s terms. No matter how good you are at haggling, eventually you will discover that you paid “too much” for something. And in virtually all instances you will be paying more than a local would. Unless you are a local, You don’t know the best places, seasons, times, products, and vendors, and if you look like a gringo you will be probably charged a “tourist tax” (which may be reduced, though not eliminated, if you can converse like a native). When this happens, remember that you’re still getting a great deal, even if you’re not getting the best deal. After all, hardly anything in the mundo Maya is very expensive, compared to prices elsewhere. You’re getting something you want, and you’re contributing to the local economy. It’s all good. Anyway, that’s my 4 3 2 cents. SHOWN: Street vendors in Antigua, Guatemala (who thought I was hilarious). LINK: A market in Antigua, Guatemala — photo by Rudy Girion at La Antigua Guatemala Daily Photo.